Colour caricature dated 1st November 1805, showing the Austrian General Karl Mack on his knees having surrendered to Napoleon. Napoleon is stood in front of him saying 'I want not your Forts, Cities, nor your Territories. Sir, I only want Ships, Colonies and Commerce.' 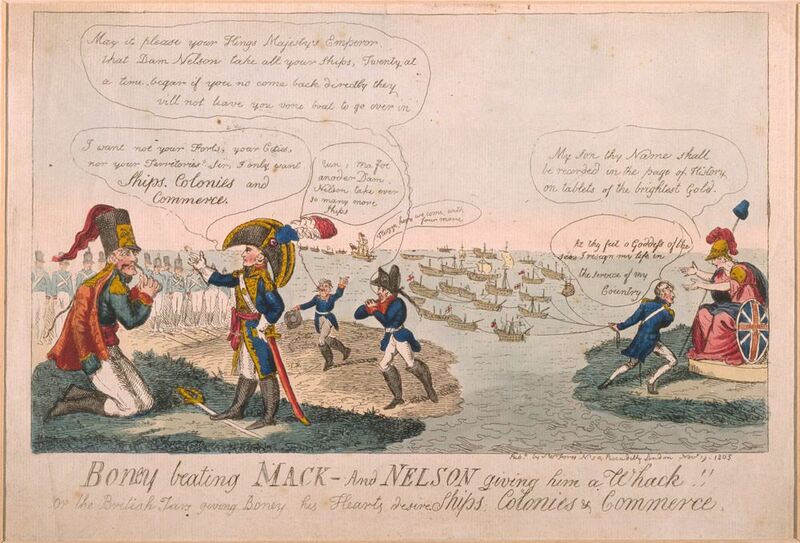 Nelson is depicted right having captured the French Fleet and is presenting it to Britannia. This Boney Beating Mack - And Nelson Giving Him a Whack! Art Print is created using state of the art, industry leading Digital printers. The result - a stunning reproduction at an affordable price. Boney Beating Mack - And Nelson Giving Him a Whack!